All over the world women, from Brazil to Bangladesh and from Canada to China, love to get together and throw baby showers for expectant moms. Although shower etiquette and what the event is called may differ country to country, the intent is the same -- to honor a mother-to-be with celebration and gifts. Babies are a wonderful cause for celebration, and the tradition of only throwing a shower for the first baby went out the window ages ago in the United States. Even fathers-to-be are getting in on the act, and some men throw their version of a baby shower for expectant dads. These male-only showers usually forgo baby themed parties and often occur at the same time the mom-to-be shower is going on, but men may still bring gifts for the baby to a "Dad's baby shower" event. Baby showers are almost always thrown by a close (female) friend or family member, although in the United States is still considered inappropriate in some social circles for a family member to host the shower. That is because the focus is to "shower" the mother-to-be with gifts and if a family hosts the event some see it as asking for gifts but when a close friend is hosting, it is seen as an offering of gifts. Specific trends in popular gifts for baby showers may fade in and out, but the demand for baby items, in general, is an evergreen market. 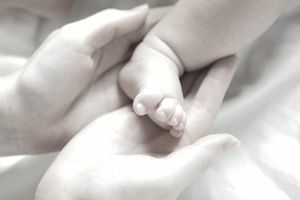 In 2008, the economic downturn took a toll on the average consumer’s ability to afford expensive baby gifts and novelty and theme items took a back seat to necessity items. Disposable incomes went down, but the need for diapers and formula did not. If you are launching a business that caters to new moms, come up with a line of products that is affordable and serves a need not just an impulse. Of course, you can - and should - consider creating baby and new parent novelties and niche products, but parents always need help with the basics. A fancy changing table loses its thrill when there are no diapers in the house! Tips and Ideas for a Baby Shower Gift Business: This article focuses on coming up with new ideas, or even a new twist on an old idea so that you can make the “ordinary” baby product seem extraordinary. Embellishing or personalizing products, or even simply by presenting them in a new, clever way can help you find a sale niche to get your business going. Tips on Marketing Products and Services For Babies and Children: During tough times (other driven by the economy or simply individual families having financial challenges of their own) parents may need to cut back on non-essential items for babies, but they still need the basics. How to Sell Your Products When No One Seems to be Buying: When finances are tight, consumers want to spend money on something they feel will improve the quality of their life – a purchase they can feel good about (investment spending) – or on something that is necessary (mandatory spending). This is another article that discusses why focusing only on "luxury" items may not be the best business decision.